If people thought that Jimmy Fallon was cozying up to President Obama and his agenda a little too much, the late night comedian has put those thoughts to rest. 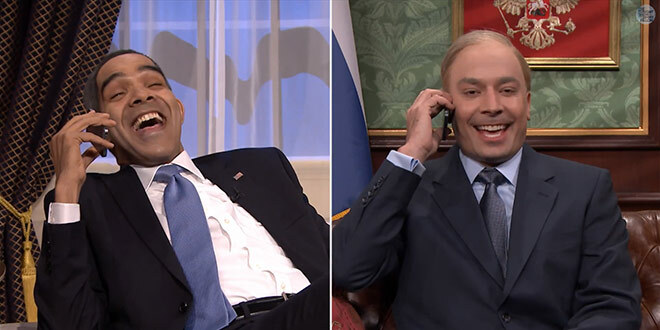 On Wednesday’s episode of NBC’s The Tonight Show Starring Jimmy Fallon, the host performed a hilarious skit with actor Dion Flynn mocking both President Obama and Russian President Vladimir Putin. The sketch reenacts a recent phone call between the two world leaders as they discuss the ongoing situation in Ukraine. With Flynn playing Obama and Fallon as Putin, the two do a proper send-up of everything from Obamacare to Senator John McCain. The two even did a little duet at the end, a parody of “Let It Go” from the movie Frozen, with a Cold War twist.